This is the beginning of wedding ceremonies in a Pakistani marriage (Pakistani shadi). The priest or Imam performs prayers for the blessings of Allah for the bride and groom. The groom’s mother visits bride’s house with sweets and shagun. This marks her formal welcome into the groom’s family. The engagement ceremony is the same as in Hindus. It involves only the family members, close friends and relatives. Ring ceremony is done and gifts are exchanged. This is the Pakistani name for Haldi ceremony. The bride and groom are smeared with turmeric and sandalwood paste and bathed in holy water, in their respective houses. This rasmor ritual takes place in the groom’s house. 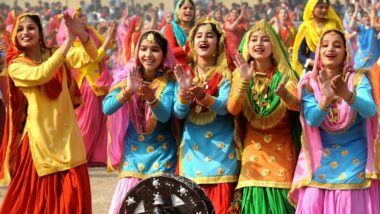 It involves beating of drum or dholkiin loud repetitions in a certain tone. This signifies their happiness for the marriage. This is the same as observed in Hindus. Henna is applied to the bride and groom’s hands and legs in their respective houses accompanied by singing and dancing and playing loud music. 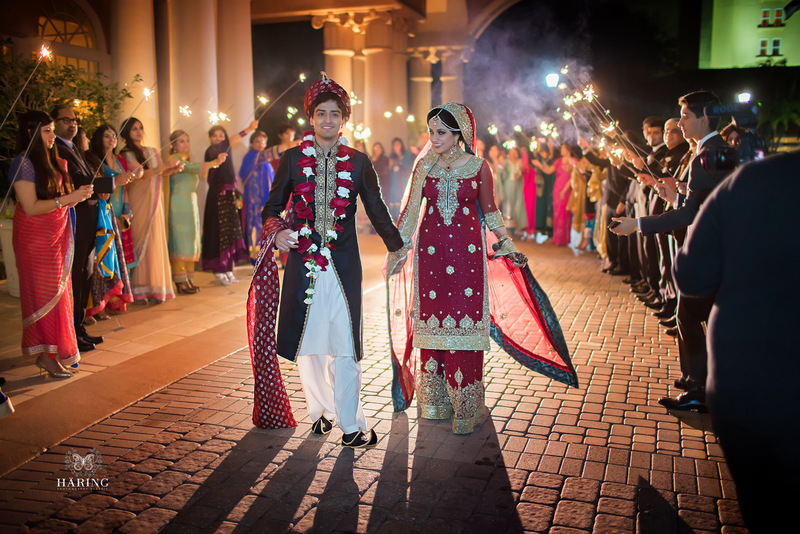 The groom dresses up in the traditional Pakistani costume and the ceremony involves loud drums and music, accompanied by singing, dancing and traditional Pakistani homemade food. On the day of Gharoli, the gifts for the bride are showcased at groom’s house. These gifts are called Bari. Similarly, the gifts from the bride’s family are also showcased, known as Daaj. The wedding procession from the groom’s house to the venue of wedding ceremony. Groom sits on a Ghodi (mule) and accompanied by his family, friends, relative, and drummers (Band). The main wedding ritual, which is performed by a Maulvi. The bride’s father is known as Wali. This ritual includes Ijab-e-Qubool which means that the bride and groom both accept each other as their partners by saying “Qubool Hai” (I accept) thrice. 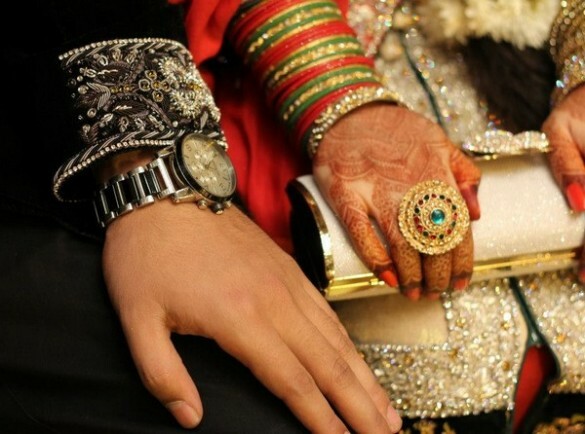 Nikah Nama is the recital of wedding vows from the Quran and signing of legal marriage contract. The elders perform Durud to bless the newlywed couple. The bride and groom look at each other through a mirror placed between them. This happens only after the Nikah. The groom’s father presents jewellery, coins, or money to the bride. This becomes her legal property. This can be anything and needs to be agreed upon by the bride herself. The groom’s family distributes packets of sweets or dry fruits to all the guests present in the wedding. This is called Bedh. 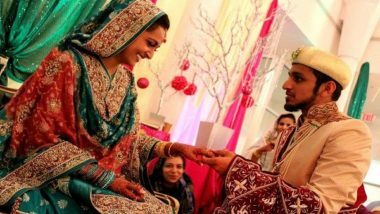 The Bidaai ceremony in Pakistani weddings is known as Rukhsati. The bride leaves for her new house. 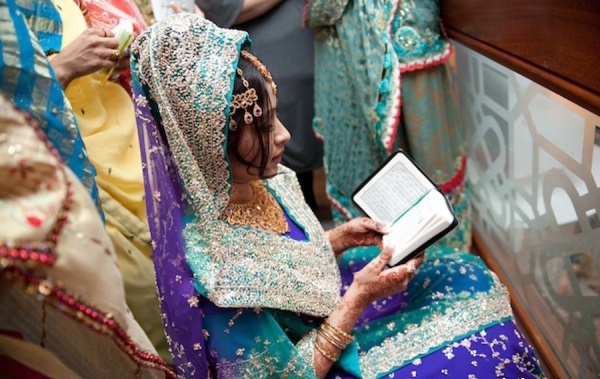 She is received at the groom’s house by placing the Holy Quran over her head. This symbolizes her duties to the new house as a wife and daughter-in-law. 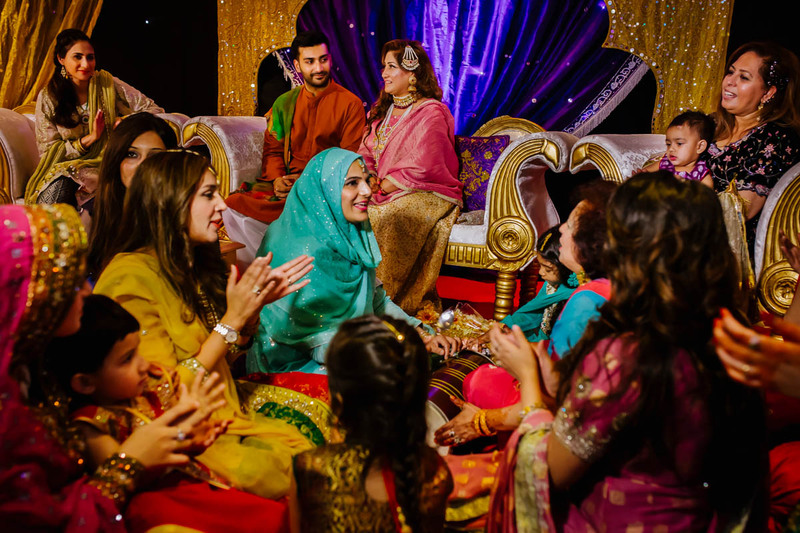 The post-wedding reception party by the groom’s family is known as Walima in Pakistani weddings. This happens on the 4th day after the wedding. The bride and groom visit the bride’s family, followed by a Lunch and exchanging of gifts. This marks to end of all wedding rituals in pakistan.